The creation of stem cells using 3D printers can bring a lot of changes in the world particularly in the field of medicine. One important application for stem cells is drug testing. Millions of laboratory animals will be spared if 3D printing can create stem cells. Collaboration between the researchers from Tsinghua University in China and Drexel University in Philadelphia developed a way of growing embryonic stem cell structures. To create the stem cell structures, researchers used an extrusion technology to create grid-like structures that encourage the growth of the stem cells. The cell structures were able to divide and organize into living tissues but the viability of the tissue is only up to a week. Researchers were astonished that the new embryonic cell structures were able to last for a week. Liliang Ouyang, one of the proponents of the study, noted that the embryoid body is homogenous and can be a good starting point for tissue growth. 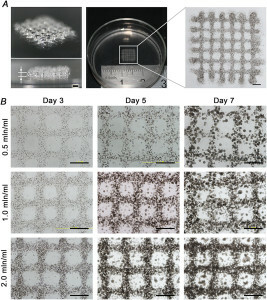 While the common method of printing cells is using suspension method, it does not result to cell uniformity thus cells become viable for up to a few days. The new method that the researchers developed is capable of becoming into different cell types of the body. The researchers are hopeful that the new technique can quickly proliferate into different embryoid bodies so that they can be used for tissue regeneration and drug testing on living tissues. For now, the researchers are finding ways on how they can change the size of the embryoid bodies so that they can create different cell types.